For smoother, quieter cuts, a single FORREST Dampener-Stiffener is highly recommended for all applications. Made from top-quality saw steel and precision ground to within 0.001" of side runout. For best results, select one stiffener 1/2 to 2/3 the blade diameter and mount it against the outside of the blade. Not for use on Dewalt 12" or Hitachi 15" saws. 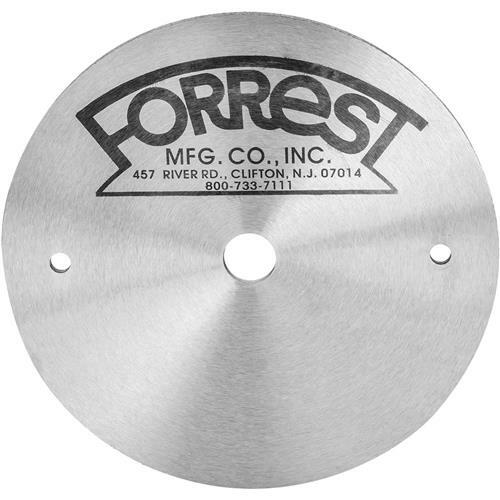 For smoother, quieter cuts, a single FORREST Dampener-Stiffener is highly recommended for all applications. Made from top-quality saw steel and precision ground to within 0.001" of side runout. For best results, select one stiffener 1/2 to 2/3 the blade diameter and mount it against the outside of the blade. Not for use on Dewalt 12" or Hitachi 15" saws.